Following the success of Conectándonos Bolivia, Rising Voices teamed with the Universidad Técnica Particular de Loja (UTPL for its initials in Spanish) to replicate the gathering in Ecuador. Thirty-four participants representing a variety of Ecuadorian provinces arrived in Loja on May 24. Although they had different interests, participants arrived ready to learn and to connect with others who are using citizen media for social change in their local communities. Georgia Popplewell (Global Voices Managing Director), Eddie Ávila (Rising Voices Director), Silvia Viñas (Global Voices Latin America Editor), Christian Espinosa (creator of Cobertura Digital), Juan Espinoza (Hivos), Carlos Correa (UTPL) and Maria Cristina Martínez (creator of Día del Blog, “blog day”) mentored the participants throughout the event. During the roundtable, participants in the auditorium and those who listened online asked questions and shared reactions using the hashtag #ConECU on Twitter. The hashtag became a ‘Trending Topic’ [es] in Ecuador thanks to the audience's participation. 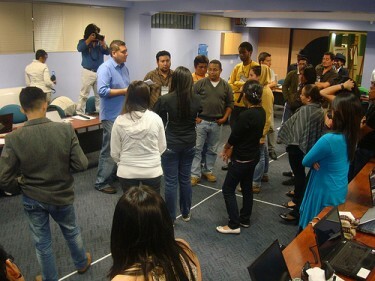 Martínez later opened a series of presentations by addressing the state of the Internet in Ecuador [es]. This was an opportunity for participants to talk about their projects in more detail. Ávila then introduced Rising Voices, sharing some examples of how people from underrepresented groups are using citizen media in different parts of the world. Later, Correa presented several Ecuadorian online communities [es] and invited participants to take advantage of these groups to grow their network. Espinoza concluded this round of presentations with a video about Hivos, the organization that helped finance this event. Participants also took part in an activity where they were asked whether they agreed with basic concepts related to the Internet. Each walked to a part of the room representing their position on these basic concepts. To finish off the first day, participants wrote down ideas for potential working groups. 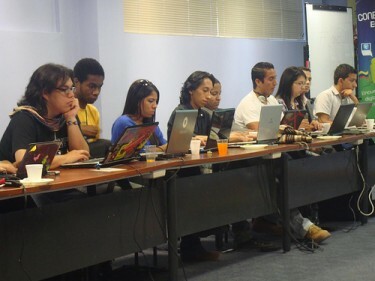 In the coming days these groups would have the opportunity to create an online project that uses citizen media. On Saturday, May 26, each group would present their project in front of their peers and mentors.